As far as educational television goes, this must be one of the most surreal shows ever made. So surreal, in fact, that a few years ago I wondered whether it might have been a weird dream or a figment of my childish imagination. But an Italian friend reassured me that the TV programme did exist; then someone uploaded the first episode online. Which must have reassured a few people of my generation that they weren’t losing the plot! Les Gammas! Les Gammas! 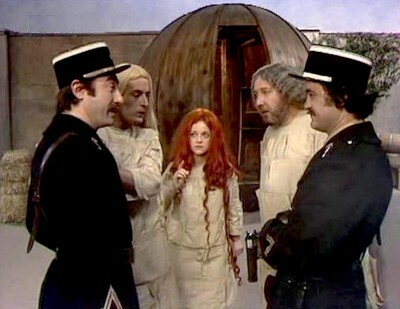 is a TV series from the 1970s broadcast in Germany, Italy and other countries, teaching French as a foreign language. No wonder my French friend didn’t know it. When I watched it, I was too young to realise the didactic nature of the programme. The Gammas are aliens who land on Earth, specifically in France. But rather than your typical Martians, they look like prehistoric humans with very long hair, all the way down to their feet. In spite of their primitive appearance, they have superhuman powers and, above all, they’re very quick at learning to speak French with perfect diction! The slow and repetitive dialogue makes the programme suitable for beginners and, at the same time, it adds to its grotesque atmosphere. By learning to communicate with the (French) humans they encounter, these bizarre-looking creatures indirectly become our profs de français. Indeed, they were my first French teachers from outer space!